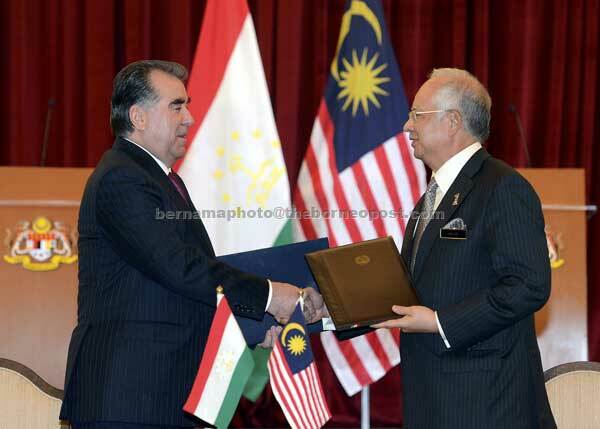 PUTRAJAYA: Malaysia and Tajikistan have agreed to work closely in various key fields to elevate bilateral relations into a qualitatively new stage. Prime Minister Datuk Seri Najib Tun Razak said both countries recognised the importance of enhancing bilateral cooperation and emphasised on cooperation in areas such as education, tourism, sports, economy, and science and technology. Speaking at a joint press conference here yesterday along with Tajikistan President Emomali Sharipovich Rahmon in conjunction with the latter’s four-day visit to Malaysia, Najib said he was confident that the visit would mark a new chapter of stronger bilateral ties between Malaysia and Tajikistan. “We have a fruitful and in-depth discussion which covered a wide range of bilateral, regional and international issues of mutual interests. “We stressed the importance of bringing our bilateral trade to a much higher level,” he said. Earlier, Najib and Rahmon witnessed the signing of five Memorandums of Understanding (MoU) and one agreement to strengthen cooperation. The MoUs signed are bilateral consultation, cooperation in the fields of higher education, tourism, physical training and sports, MoU with the Olympic Council of Malaysia (OCM) and the Agreement on Economic, Technical and Scientific Cooperation. Najib said Malaysia welcomed more Tajikistan students to pursue their study here especially in the communications field. Currently there were more than 200 Tajikistan students in Malaysia. He said both countries also recognised the scope in people-to-people contact and the MoU would facilitate more Tajikistan nationals to visit Malaysia. “We will continue to support Tajikistan in training and technical programme,” he said. As Muslim countries, Najib added that Malaysia and Tajikistan would work closely pertaining to issues on Muslims and shared a common decision. “We are concerned about the challenges in Muslim world and we will work closely for unity,” he said. The prime minister thanked Tajikistan’s support for Malaysia’s candidature for a non-permanent seat on the United Nations Security Council for the 2015 to 2016 term. Najib said Rahmon also extended an invitation to Yang di-Pertuan Agong and the prime minister to undertake a reciprocal visit to Tajikistan next year. This is Rahmon’s first state visit to Malaysia since the establishment of diplomatic ties between Tajikistan and Malaysia in 1992. The delegation of Tajikistan also comprised its Foreign Minister Aslov Sirodjidin, Economic Development and Trade Minister Rahimzoda Sharif, Education and Science Minister Said Nuriddin, senior government officials and businessmen.